The application of moist heat is a commonly prescribed therapy in medical practice today, and the Thermophore Moist Heat Pack is the method physicians' recommend most often. Moist heat increases circulation and speeds recovery by bringing in fresh blood cells and taking away the wastes, which may hinder healing. These beneficial results continue for several hours after treatment. The application of moist heat, known as fomentation, is especially useful in treating back pain caused by muscle spasms from strain and tension. The Thermophore Moist Heat Pack and rest will gradually relax the muscle in spasm, restoring its normal length and relieving pain. The moisture produced by the Thermophore Moist Heat Pack transfers the high heat deeper into tissues than an ordinary dry heat pad. Arthritic and rheumatic pain is often temporarily relieved with the use of moist heat. The increased blood flow can relieve the inflamed joints and help maintain flexibility. No water needed. Thermophore produces its own moisture. The Thermophore Moist Heat Pack produces moist heat automatically by drawing moisture from humidity in the air and retaining it in the hot pack's outer flannel cover. The rapid heat rise occurring when the hot pack is turned on forces the moisture out of the flannel onto the patient's skin, speeding temporary relief to the treated area. Intense, moist heat makes Thermophore better. The Thermophore Moist Heat Pack is more effective than other electric heating pads on the market because it delivers very intense, moist heat. The patient controls the temperature of the hot pack with the momentary switch (powered when held down) for better heat control. The hand-held momentary switch, turns the hot pack on and off, and allows the user to maintain the highest temperature possible. Thermophore Moist Heat Packs should be used at the first sign of muscle spasm or joint pain. A Thermophore Moist Heat Pack treatment is especially useful to help temporarily relieve pain caused by muscle spasm or inflammation after a day of recreation, gardening, jogging or household chores. The max temperature goes up to 180 Degrees Fahrenheit (Unit only has one temperature setting). Comes with a 1 year warranty. Easy To Use. Heats Up Quickly. Comfortable. Even Heat. Safe. Sturdy. Effective. Arthritic Pain. Daily Use. Muscle Spasms. Sore Muscles. Chronic Pain Issues. back & hip pain. neck & shoulder pain. knee pain. We now have 3 of these large heating pads. My husband has one on his recliner; I keep one on my loveseat and the third one is moved between our bed and my sewing room. Would like to get a 4th one so I don't have to keep moving it. Use it to keep muscle spasms away after cleaning, etc. and for arthritis pain. Probably use it a total of 4 or 5 hours a day while reading, sewing, chores I can sit to do, etc. The pads make it possible for us to do more things we like to do and things we have to do to stay independent living at home. The chores take longer with frequent breaks but we can stay in our home in relative comfort. Great for back pain. Heats Up Quickly. Comfortable. Easy To Use. Heavy. I like the weight of it. Arthritic Pain. Daily Use. Following Surgery. Muscle Spasms. Sore Muscles. Emergency. Elderly. Elderly. Chronic Pain Issues. back & hip pain. neck & shoulder pain. Quality Oriented. This is the best heating pad I&acirc;&#128;&#153;ve ever owned. I have bulging discs &amp; I put my thermaphore heating pad on it takes my pain away. I&acirc;&#128;&#153;ve used them for 23 years. I have 3 so I can have one upstairs, one downstairs &amp; one packed in my suitcase for when I travel. I still have the first one I bought &amp; it still works great. I love the weight of it because it stays where I need it. I just love it. Heats Up Quickly. Easy To Use. Compact Design. Comfortable. Even Heat. Easy Storage. Safe. Sturdy. Good Value. Effective. Muscle Spasms. Sore Muscles. Arthritic Pain. Daily Use. Emergency. I have used mine for over 15 years that I had gotten while in PT.It heats up so fast and also has the moist heat which is great,last week it stopped working and I was so happy to find this replcement don't know what I would do without it, most of the other ones do NOT even compare with this one. You have to hold the button the entire time and you can not lay on it!!! If you have arthritis in your hands, you can not use it! Heats Up Quickly. Easy To Use. Even Heat. tad heavy prob helps tx. Sore Muscles. Arthritic Pain. Daily Use. Fibromyalgia. neck & shoulder pain. back & hip pain. knee pain. This one has the toggle that has to be held down. My relative hates it. It also is uneven with the heat. It is back in the box stored away. Try BodyMed heating pads for one with a timer and exact temperature settings. Do you have the items for 220Volt? Although the direction say not to I find it some times the only way to get the pad hot enough for me. I have had 1 go bad at least 2 years after I bought it. I could see copper(blue) stains on the pad itself. I also have laid the pad on me. I use it to stop back pain, I would get the one with out the timer as I find that it does get hotter if you lay on it and so the manual switch is best if you have no problems with your grip. I ONLY buy Thermophore as it lasts the longest has the best construction. I have had one last at least 3 years. I have 3 (2)largest and (1) neck. The others on the market are not worth the money. For a patient who has hand mobility problems: I push the button down and then position the switch under my rear as I lie on the pad. Thermophore generates heat so quickly that I am able to half roll off position to remove switch easily. When first using Thermophore, monitor time. Even set an alarm clock for 8 min. Do you have a heating pad that doesn't need the button to be held or pushed to maintain the heat, so I could use it while driving? Asked on Feb 9, 2012 2:00:38 AM by Loida from Carpentersville Il. Yes, there are automatic switches. 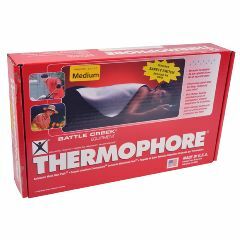 Go to Thermophore or Battle Creek individual sites or Amazon and check on Product features. Yes, Virginia there is a Santa Claus and there is an automatic switch, though I prefer the manual as oftentimes I fall asleep with the soothing heat from the pad. I put Velcro around my switch before they came out with the other one. I love the new switch but it keeps shorting out after about a year. Yes you have to hold the button because it gets very hot. This is a great heating pad and recommend for your son. But before using he should go get himself checked out with a doctor to sure it is just a strain. yes. cold water. hang dry. washing machine ok. be sure to remove cover from heating pad!! Hi, I would hand wash it in soapy luke warm water, rinse with cold water until the bubbles are gone, and let it air dry. That way, you don't have to worry about it tearing in the washer or shrinking.